Being on a tight schedule does not mean you have to be deprived of the luxury of a soul-warming home-cooked meal. With the best meal kit delivery services, you can get all your daily tasks done and still get a beautiful meal on the table at the end of the day. Browse our top selection, pick your favorite, and master the art of effortless cooking. 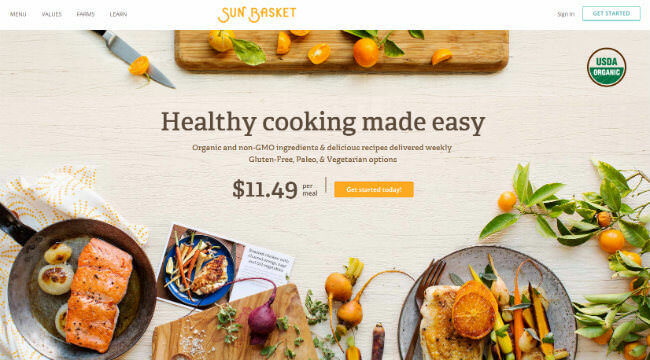 Sun Basket is a first-class meal kit delivery service where nutrition and inspiration are combined with extraordinary flavor. Choose from 11 distinct meal plans designed for busy home cooks. Home Chef is a meal delivery service well known for the quality of its ingredients, customizable taste preference, and a big variety of new recipes, which are changed on a weekly basis. Blue Apron has long been one of the best US meal kit services. Its menu is rich and creative, its ingredients are of the highest quality, and its recipes are designed with all skill levels in mind. With Plated is a meal kit delivery service that can provide you with an exceptional cooking experience. Its payment plans are very flexible and the ingredients are of the highest quality. HelloFresh lets you enjoy cooking for your family, minus all the hassle. With its natural, pre-measured ingredients and easy recipes, you can get maximum flavor with minimum prep and cleanup. Purple Carrot is one of the rare completely vegan meal delivery services. It brings you fresh seasonal ingredients and creative recipes every week, helping you to easily improve your health. Green Chef is a good choice for both singles and families. It provides organic ingredients and simple recipes that can allow you to improve your eating habits and lead a healthier lifestyle. Marley Spoon brings you Martha Stewart’s incredible recipes and fresh, delicious ingredients every week. Order meals for 2 or a family of 3-4 and cook like a pro. Free shipping on all orders! Use code: ASUB15NET4W and save $15 on each of your first four boxes! Terra’s Kitchen is a meal kit delivery service that offers a variety of healthy, delicious, quick-to-make meals. Pick the dinners you want to cook and throw in some tasty add-ons along the way. Gobble is a meal kit service that provides pre-portioned ingredients and easy-to-follow recipes for superb lunches and dinners. With Gobble, you can prepare your meals in just 10 minutes. When you are stretched for time, cooking can feel like a real chore. Spending hours grocery shopping, prepping the food, and carefully browning, sautéing, blanching, and broiling the ingredients you have previously sliced and chopped is a luxury you simply cannot afford. With the best meal kit delivery services, you can enjoy a scrumptious home-made meal even if you have no more than 30 minutes to spend in the kitchen. These convenient services hand-pick and pre-measure the ingredients for you. They allow you to expand your repertoire with delicious recipes and bring greater variety into your diet. They provide recipes that are inspiring but simple enough to suit any cooking skill level. They minimize the prep time, let you focus on cooking, and allow you to make meals you can be proud of in very little time. They do most of the work for you but do not overcharge you for the service. To sum up, with the best meal kit delivery services, you get all the freshest, natural, pre-portioned ingredients delivered to your door, you get to spend less time in the kitchen, and you get to cook restaurant-grade meals with less effort, all this at a price that suits virtually any budget. You can finally relax and let professionals take care of grocery shopping, ingredient preparation, and meal planning. You no longer have to stress about what to cook next. You get to know in advance what meals you are going to enjoy the following week and look forward to exploring different cuisines, recipes, and flavors. The best meal kit delivery services always strive to provide a unique offer that is more varied, more attractive, more affordable, and more satisfying than that of their competitors. Unlike many services of their kind, the best meal kit deliveries make sure that the quality of their food never fluctuates. The produce they provide is never wilted, the meat and seafood are never less-than-fresh, and everything is always natural, flavorful, nutritious, and good for you. Their dedication to quality is what sets them apart from the rest and make them services that you can trust and rely on. All meal kit deliveries promise to help you easily cook impressive meals in little time but only a few make good on their promise. With the meal kit services featured on our list, you never have to deal with missing steps in the recipes, complicated techniques not everyone can follow, and time-consuming preparation. The recipes are always both simple and creative and the cooking process never lasts longer than indicated. One of the main reasons why home cooks opt for meal kits is that they give them the opportunity to try out new recipes every week and avoid repeating the same meals ad nauseam. However, not all meal kit services offer the variety their patrons seek. That is why we searched long and hard for services whose culinary teams are characterized by limitless gastronomic inspiration and years-long experience, which combined leads to the creation of innovative recipes you cannot wait to try out. Whoever said that you cannot please them all obviously has not tried hard enough. We believe that perfection is attainable and that is what we expect from the best meal kit delivery services that we feature on our list. Our selection criteria may be strict, but that is why we can guarantee that our top picks have what it takes to please our readers, whatever their preferences may be. In order to get a spot on our top list, meal kit delivery companies must provide an impressive variety of meal kits. The range of meal options they offer has to cover the needs of home cooks with different lifestyles and dietary needs. Their recipes must be characterized by both optimal nutritional value and superior flavor. The portion sizes should be carefully calculated to satisfy the needs of adults, as well as children. The ingredients need to be perfectly portioned, so you never leave the table unsatisfied. We understand and support our readers’ desire to have the freedom to choose everything from the quantity and quality of the meal kits in their deliveries to delivery frequency and the length of their subscription. That is why we only choose the meal kit companies that offer flexible subscriptions that can be customized to suit your lifestyle, with the possibility to skip deliveries and pause or cancel your subscription at your convenience. Finally, we want you to get what you paid for, every time. The meal kit deliveries on our top list offer the best meal kits at the best prices. The following price comparison is designed to help you easily figure out which of our top-ranked meal kit delivery services best fits your budget. We have brought all the pricing information to one place, including the shipping costs and details about the companies’ delivery areas, so you can identify the perfect fit in a single glance. What all of our top picks have in common is that they are currently the best on the market. Now it is time to discover what makes each of these meal kit companies unique. Explore their distinctive features in the mini-reviews below and choose the one that best satisfies your personal needs. Sun Basket is an organic meal kit delivery service that has you spoilt for choice, with 18 amazing meal ideas on its weekly menu. You can choose 2, 3 or 4 recipes for 2 or 4 people and cook up a delight in just half an hour. The recipes are designed to suit a variety of diets including vegan, vegetarian, Paleo, Mediterranean, pescatarian, and gluten-free. Satisfaction and superior flavor are guaranteed. In addition to 13 new dinner recipes every week, Home Chef boxed meal delivery offers something unique to its patrons: 3 lunches that take just 5 minutes to make and 2 deliciously sweet and healthy add-ons, including a fruit basket and a smoothie. You can order 2, 3, 4, 5 or 6 recipes for 2, 4 or 6 people per week. The selection is varied and includes omnivore, vegetarian, low-carb, and low-calorie dishes. Blue Apron meal kit service is best known for the creativity of its recipes. It offers 22 exciting meal ideas every week and lets you choose from 4 carefully crafted meal plans. The ingredients are fresh and organic whenever possible and the recipes are suitable for vegetarians and omnivorous foodies alike. You can even enjoy special meals designed in cooperation with WW, Weight Watchers reimagined. Complement your delicious meals with a bottle of fine wine from the Blue Apron wine club. With 20 dinner recipes and 2 dessert ideas on its weekly menu, Plated is a healthy meal kit delivery service that aims to impress with both the quality and the variety of its meal kits. With Plated, you can cook for 2, 3 or 4 people 2, 3 or 4 times a week and create gorgeous meals that are sure to wow any vegetarian, omnivore or seafood lover. You cannot go wrong with HelloFresh, the highly popular meal prep delivery service that makes cooking healthy and tasty meals as simple as it gets. With 17 recipes on its Classic menu, 3 recipes for veggie lovers, and 9 delicious dinners for the whole family, it manages to satisfy the needs of thousands of home chefs around the nation. To make your meals more special, HelloFresh meal kit service offers quality wine from its own cellar. Purple Carrot is one of the best meal kit delivery services for vegans. It lets you choose from 3 standard meal plans for a healthy and balanced plant-based diet. 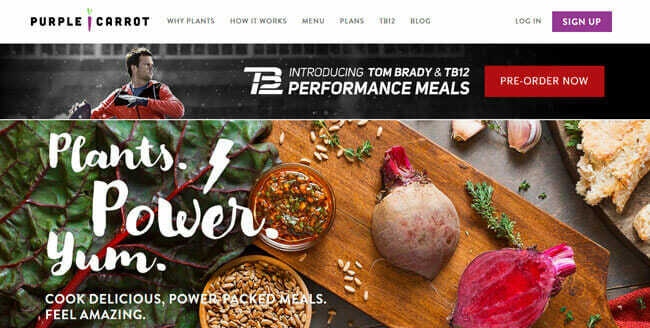 If you lead an active lifestyle, you can opt for the TB12 Performance meal plan and cook meals inspired by Tom Brady’s diet. You can freely choose the meals from the weekly menu and order 3 dinners per week. With the standard plans, you can also grab a couple of breakfast and lunch add-ons that are ready in just 5 minutes. Green Chef meal box delivery service does not only offer great meal kits for couples and families, but also covers a spectacular range of special diets, with meal plans suitable for omnivore, carnivore, pescatarian, gluten-free, vegan, vegetarian, keto, and Paleo diets. No matter which meal plan you choose, you get 3 mouthwatering recipes per week. If you feel like switching things up, you can opt for a different meal plan whenever you wish. Marley Spoon, also known as the Martha Stewart meal kit service, offers some of the tastiest meal kits we have ever tried. With 20 delicious recipes per week, broken down in just 6 simple steps, cooking like Martha is easier than you ever imagined and the results are nothing short of sheer perfection. The recipes are designed for couples and families and include vegetarian, gluten-free, dairy-free, low-carb, and low-calorie options. Inspired by the Mediterranean cuisine, Terra’s Kitchen is a healthy meal kit service that knows how to please both your body and your palate. It offers a sensationally rich selection of 50 recipes, including dinners, lunches, snacks, sides, proteins, beverages, desserts, and even recipes suitable for weight loss. The meals can take as little as 15 minutes to make and you can choose whether you want to cook for 2 or 4 people. With Gobble meal kit service, cooking a healthy meal is as easy as preparing a frozen dinner. The Gobble team does all the shopping, chopping, and trimming, so you can skip straight to cooking, with zero prep. The meals are ready in just 10 to 15 minutes, the recipes are incredibly varied and colorful, and everything on the menu is as flavorful as it is good for you.